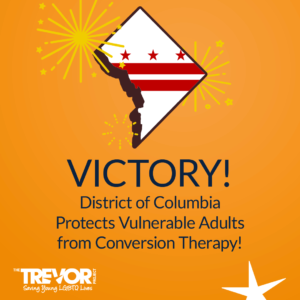 Washington, D.C. — Mayor Muriel Bowser signed the “Conversion Therapy for Consumers under a Conservatorship or Guardianship Amendment Act of 2018,” also known as ACT 22-573, a bill that extends Washington, D.C.’s conversion therapy protections for LGBTQ youth to also include adults who are under the care of guardians or conservators. Conversion therapy falsely claims to be able to change a person’s sexual orientation or gender identity, and is dangerous and discredited. “Medical and mental health professionals condemn the practice of conversion therapy, which is why I previously banned the practice for minors: to protect them from the increased risk of depression, substance abuse, and suicide that is associated with this harmful practice. This bill now fills a further gap to ensure that conversion therapy cannot be forced on someone who is unable to provide consent. It is courageous to live an open, honest life — full of purpose and meaning. I see none of those values in these types of therapies and they must not be accepted in the District of Columbia,” said Councilmember Mary M. Cheh, Ward 3, the author of the bill. With ACT 22-573, Washington, D.C. becomes the first to enact legislation that protects people over the age of 18 who are subject to legal guardianship from conversion therapy. The D.C. Council passed the bill unanimously on December 4, 2018, and it was signed by Mayor Bowser on January 16, 2019. Nearly 700,000 LGBTQ adults have been subjected to conversion therapy, with 350,000 of them receiving the dangerous and discredited treatment as youth. That number grows by thousands each year as the Williams Institute estimates that nearly 80,000 LGBTQ youth will be subjected to conversion therapy in the next few years. “With this measure, DC is leading the nation in protecting some of our most vulnerable LGBTQ people – those who despite their adulthood are not allowed by the state to make their own medical decisions. Far too often we’ve seen guardianship being used to prevent LGBTQ people from being who they are. This bill is a monumental step in the right direction and we hope other states follow DC’s example,” said Victoria M. Rodríguez-Roldán, Senior Policy Counsel for the National LGBTQ Task Force. Conversion therapy is widely opposed by prominent professional health associations including the American Medical Association, the American Psychological Association, and the American Academy of Pediatrics. “This is an important step toward protecting the rights of LGBT people with disabilities. Guardians of disabled adults are often empowered to make medical and mental health decisions without the adults’ consent. This bill will ensure that, at least, those decisions won’t include forcing disabled LGBT adults into abusive and coercive ‘therapies’ that we know to be harmful,” said Sam Crane, Director of Public Policy for the Autistic Self Advocacy Network. The Trevor Project’s 50 Bills 50 States campaign works to support legislation like ACT 22-573 to protect LGBTQ people from conversion therapy in every state. People can sign up to join The Trevor Project’s effort to end conversion therapy by texting “TREVOR” to 40649. The Autistic Self Advocacy Network is a 501(c)(3) nonprofit organization run by and for autistic people. ASAN was created to serve as a national grassroots disability rights organization for the autistic community, advocating for systems change and ensuring that the voices of autistic people are heard in policy debates and the halls of power. Our staff work to advance civil rights, support self-advocacy in all its forms, and improve public perceptions of autism. ASAN’s members and supporters include autistic adults and youth, cross-disability advocates, and non-autistic family members, professionals, educators, and friends. The National LGBTQ Task Force is the oldest national LGBTQ advocacy group in the country that works to achieve equality and equity for all and move society to value and respect the diversity of human expression and identity. Also the Task Force organizes Creating Change, the foremost political, leadership, and skills-building conference for the LGBTQ social justice movement with over 3,500 attendees.